Not long afterward, the local surgeon and male mid-wife, John Howard, was summoned to the Toft home because Mary had gone into labour again. Having helped Mary with her miscarriage, Howard was quite surprised by the summons. He was more surprised when he delivered nine rabbits out of Mary. They weren’t entire rabbits, mind you, but rabbit parts. Howard was shocked, nonetheless and immediately sent word to London physicians about the event. Two of these doctors were King George I’s doctors, and when they told the king, he immediately sent them to Godalming to investigate. Lo and behold, Mary gave birth to more rabbits in their presence. After putting a rabbit lung in water and seeing it float the educated men of medicine decided that the rabbit had breathed air which doesn’t happen inside the womb. She really was giving birth to live rabbits! 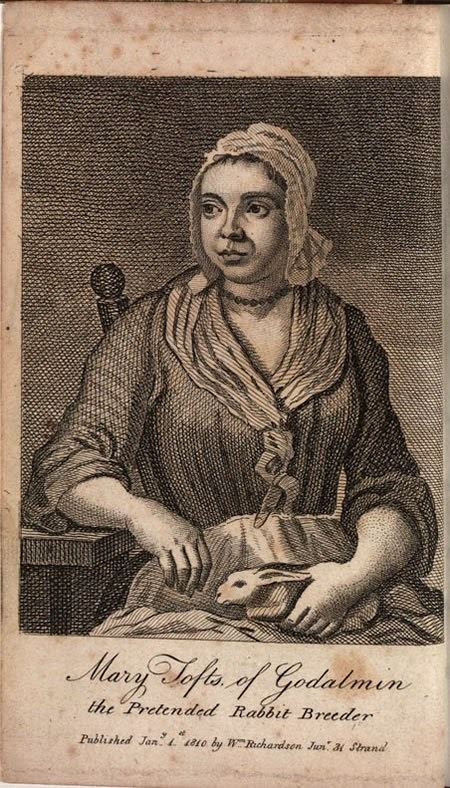 They inferred that the miraculous births were due to maternal impressions, since Mary drempt and craved rabbits beforehand.